This article is about the islands in California. For the British Islands, see Channel Islands. The Channel Islands form an eight-island archipelago along the Santa Barbara Channel in the Pacific Ocean off the coast of southern California. Five of the islands are part of Channel Islands National Park, and the waters surrounding these islands make up Channel Islands National Marine Sanctuary. The islands were first colonized by the Chumash and Tongva Native Americans 13,000 years ago, who were then displaced by Spaniards who used the islands for fishing and agriculture. The U.S. military uses the islands as training grounds, weapons test sites, and as a strategic defensive location. The Channel Islands and the surrounding waters house a diverse ecosystem with many endemic species and subspecies. The islands harbor 150 unique species of plant that are found only on the Islands and nowhere else in the world. The eight islands are split among the jurisdictions of three separate California counties: Santa Barbara County (four), Ventura County (two), and Los Angeles County (two). The islands are divided into two groups; the northern Channel Islands and the southern Channel Islands. The four northern Islands used to be a single landmass known as Santa Rosae. The archipelago extends for 160 miles (257 km) between San Miguel Island in the north and San Clemente Island in the south. Together, the islands’ land area totals 221,331 acres (89,569 ha), or about 346 square miles (900 km2). 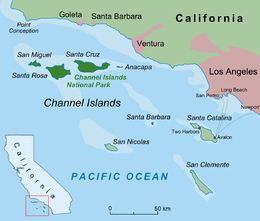 Five of the islands (San Miguel, Santa Rosa, Santa Cruz, Anacapa, and Santa Barbara) were made into the Channel Islands National Park in 1980. The Channel Islands National Marine Sanctuary encompasses the waters six nautical miles (11 kilometres; 6.9 miles) off these islands. Santa Catalina Island is the only one of the eight islands with a significant permanent civilian settlement—the resort city of Avalon, California, and the unincorporated town of Two Harbors. University of Southern California also houses its USC Wrigley Institute for Environmental Studies marine lab in Two Harbors. Natural seepage of oil occurs at several places in the Santa Barbara Channel. Tar balls or pieces of tar in small numbers are found in the kelp and on the beaches. Native Americans used naturally occurring tar, bitumen, for a variety of purposes which include roofing, waterproofing, paving and some ceremonial purposes. The Channel Islands at low elevations are virtually frost-free and constitute one of the few such areas in the 48 contiguous US states. It snows only rarely, on higher mountain peaks. Separated from the California mainland throughout recent geological history, the Channel Islands provide the earliest evidence for human seafaring in the Americas. It is also the site of the discovery of the earliest paleontological evidence of humans in North America. The northern Channel Islands are now known to have been settled by maritime Paleo-Indian peoples at least 13,000 years ago. Archaeological sites on the island provide a unique and invaluable record of human interaction with Channel Island marine and terrestrial ecosystems from the late Pleistocene to historic times. The Anacapa Island Archeological District is a 700-acre (280 ha) historic district that was listed on the National Register of Historic Places (NRHP) in 1979. Historically, the northern islands were occupied by the island Chumash, while the southern islands were occupied by the Tongva. Author Scott O'Dell wrote about the indigenous peoples living on the island in his novel Island of the Blue Dolphins. Aleut hunters visited the islands to hunt otters in the early 1800s. The Aleuts purportedly clashed with the native Chumash, killing many over trading disputes. Aleut interactions with the natives were also detailed in O'Dell's book. The Chumash and Tongva were removed from the islands in the early 19th century and taken to Spanish missions and pueblos on the adjacent mainland. For a century, the Channel Islands were used primarily for ranching and fishing activities, which had significant impacts on island ecosystems, including the local extinction of sea otters, bald eagles, and other species. Several of the islands were used by whalers in the 1930s to hunt for sperm whales. With most of the Channel Islands now managed by federal agencies or conservation groups, the restoration of the island ecosystems has made significant progress. An example of conservation progress has been the bald eagle, which was threatened due to DDT contamination, but whose populations are now recovering. With the help of scientists from the USC Wrigley Institute for Environmental Studies, the Catalina Island Fox has also recovered from a low of 100 individual foxes to over 1,500 foxes in 2018. In 1972, in "a bit of political theater”, twenty-six Brown Berets sailed to Catalina Island on tourist boats, set up a small encampment near the town of Avalon, put up a Mexican flag and claimed the island on behalf of all Chicanos, citing the Treaty of Guadalupe Hidalgo. Twenty-four days later, sheriff's deputies took everyone back to the mainland. Channel Islands National Park's mainland visitor center received 342,000 visitors in 2014. The islands attract around 70,000 tourists a year, most during the summer. Visitors can travel to the islands via public boat or airplane transportation. Camping grounds are available on Anacapa, Santa Rosa, Santa Cruz, San Miguel, and Santa Barbara Islands in the Channel Islands National Park. Attractions include whale watching, hikes, snorkeling, kayaking and camping. An approximate map of the Channel Islands' land extent roughly 14,000 years ago, showing their historical connection to each other. While they are currently separated from mainland California by a 230 metres (750 feet) deep channel, at this point in history they were only 7.8 kilometres (4.8 miles) from the mainland compared to the modern 19 kilometres (12 miles), making prehistoric travel between them much easier. The United States Navy controls San Nicolas Island and San Clemente Island, and has installations elsewhere in the chain. During World War II all of southern California’s Channel Islands were put under military control, including the civilian-populated Santa Catalina where tourism was halted and established residents needed permits to travel to and from the mainland. San Miguel Island was used as a bombing range and Santa Barbara Island as an early warning outpost under the presumed threat of a Japanese attack on California. San Clemente Island was used to train the Navy's first amphibious force to prepare for Pacific combat against the Japanese in World War II. San Nicolas Island has been used since 1957 as a launch pad for research rockets. San Nicolas was considered (out of eight possible locations) as the site of the Trinity nuclear test. Santa Rosa Island was used in 1952 as a base for the USAF 669th AC&W Squadron and they operated two Distant Early Warning FPS-10 radars from the hilltops there. In 1955 another FPS-3 search radar was added, and in 1956, a GPS-3 search radar was installed. A new MPS-14 long-range height-finder radar was installed in 1958. The base was shut down in March 1963, when the 669th was moved to Vandenberg AFB In Lompoc, California. The islands still house US Navy SEALs training facilities, including Naval Auxiliary Landing Field San Clemente Island. The Channel Islands form part of one of the richest marine ecosystems of the world. Many unique species of plants and animals are endemic to the Channel Islands, including fauna such as the Channel Islands spotted skunk, ashy storm-petrel, Santa Cruz sheep, and flora including a unique subspecies of Torrey pine. A Catalina Island Fox. Their population dwindled to 100 individuals before rebounding with the help from scientists from the USC Wrigley Institute for Environmental Studies. Flora on the Channel Islands include a unique subspecies of pine, oak, and the island tree mallow. Santa Rosa Island holds two groves of the Torrey pine subspecies Pinus torreyana var. insularis, which is endemic to the island. Torrey pines are the United States' rarest pine species. The islands also house many rare and endangered species of plants, including the island barberry, the island rushrose, and the Santa Cruz Island lace pod. Giant kelp forests surround the islands and act as a source of nutrition and protection for other animals. Invasive species, such as the Australian blue gum tree, olive tree, sweet fennel, and Harding grass, threaten native species through competition for light, nutrients, and water. The Australian blue gum, for example, releases toxins in its leaf litter which prevents other species of plants from growing in the soil surrounding it. The blue gum, as well as other species including the Harding grass, are much more flammable and better adapted to wildfires than native species. Earthworms, thought to have come from mainland topsoil imported for road construction, are altering the unique ecosystem and microbial communities on San Clemente Island, threatening biodiversity. In this formerly earthworm-free region, they change the distribution of plants and vegetation, making it possible for non-native plants to invade. The Channel Islands and the waters surrounding hold many endemic species of animals, including fauna such as the Channel Islands spotted skunk, island scrub jay, ashy storm-petrel, Santa Cruz sheep, San Clemente loggerhead shrike, and the San Clemente sage sparrow. Two breeds of livestock, the Santa Cruz sheep and the San Clemente Island goat originate from here. Many species of large marine mammals, including pacific gray whales, blue whales, humpback whales, and California sea lions breed or feed close to the Channel Islands. Current occurrences of the critically endangered North Pacific right whales and historically abundant Steller's sea lions in these areas are unknown. Seabirds, including the western gulls, bald eagles, pigeon guillemots, and Scripps's murrelets use the islands as well for shelter and breeding grounds. The endemic island fox is California's smallest natural canine and has rebounded from its near extinction in the late 1990s. Several endemic reptile and amphibian species including the island fence lizard, island night lizard, and Channel Islands slender salamander live on the islands. Conservation efforts are being made to maintain the islands' endemic species. Feral livestock, including pigs, goats, and sheep, pose a threat to many of the species, including the San Clemente loggerhead shrike and Channel Islands spotted skunk. The National Park Service eradicated the feral pigs on Santa Rosa and Santa Cruz islands during the 1990s and on Santa Catalina Island in 2007. Introduced pathogens have devastated island species due to isolation from the mainland. In 1998, an outbreak of canine distemper swept through Santa Catalina Island severely reducing the island skunk and fox populations. Rabies and distemper vaccination programs were initiated to protect the island's wildlife. Canine distemper is thought to have been brought to the islands on a stowaway raccoon or a domestic dog. In the 1950s, bald eagles and peregrine falcons on the Channel Islands became locally extinct after widespread use of pesticides such as DDT. The birds ingest contaminated fish and seabirds which poisons the adults and weakens their eggs. Golden eagles, which are natural competitors of other birds of prey, do not primarily feed on these animals and were able to colonize the islands in the early 1990s. In the early 2000s, golden eagles were live trapped and relocated. In 2002 and 2006 breeding pairs of bald eagles were reintroduced to the northern islands. Later in 2006, the introduced adult eagles hatched chicks on the islands for the first time since their extinction. The Channel Islands National Park established a bald eagle webcam on their website in 2007. Santa Cruz Island was claimed to be the setting for scenes in the final episode of season three of the American TV crime drama series Bosch, shown in 2017. Scott O’Dell’s novel for young adults titled “Island of the Blue Dolphins” is based on the story of a tribal woman living alone on one of the remote Channel Islands in the 19th century. ^ "UAE Tours - Channel Islands United States - California, Information of island, weather and pictures". www.vjcyber.com. Retrieved 2018-08-15. ^ "Things To Do In Ventura CA | Channel Islands National Park". Ventura California. Retrieved 2018-08-15. ^ Hostettler, Frances D; Rosenbauer, Robert J; Lorenson, Thomas D; Dougherty, Jennifer (2004). "Shallow seepage impacting the Santa Barbara Channel Islands, Santa Cruz, Santa Rosa and San Miguel". Organic Geochemistry. 35 (6): 725–746. doi:10.1016/j.orggeochem.2004.01.022. ^ "Natural Oil and Gas Seepage in the Coastal Areas of California" (PDF). Archived from the original (pdf) on 2011-05-13. ^ "San Nicolas Island" (PDF). nps.gov. Santa Barbara Botanic Garden via National Park Service. 2008. Retrieved 2018-11-12. ^ "Journey to 10,000 B.C". History Channel. Aired 4 May 2008. ^ a b c "Park Timeline" (PDF). National Park Service. National Park Service. Retrieved 5 May 2015. ^ "Bald Eagles make a comeback on the Channel Islands". vcreporter.com. Ventura County Reporter. April 19, 2012. Retrieved December 14, 2018. ^ "Channel Island foxes make a comeback". phys.org. Retrieved 2018-12-14. ^ del Olmo, Frank (June 29, 1997). "Who Remembers the Invasion of Catalina?". Los Angeles Times. Retrieved 30 March 2016. ^ "NPS Annual Recreation Visits Report". National Park Service. ^ "Plan Your Visit – Channel Islands National Park (U.S. National Park Service)". Channel Islands National Park. National Park Service. Retrieved 7 May 2015. ^ "Catalina Island During WWII". Archived from the original on 2011-05-16. Retrieved 2008-03-08. ^ "San Miguel Island (9,325 acres)". Retrieved 2008-03-08. ^ "Santa Barbara Island (639 acres)". Retrieved 2008-03-08. ^ a b "San Clemente Island". History. San Clemente Island. Archived from the original on 6 October 2015. Retrieved 8 May 2015. ^ "Trinity Atomic Web Site". Walker, Gregory. Archived from the original on 2010-04-20. Retrieved 2010-08-20. ^ "Kelp Forests – Channel Islands National Park (U.S. National Park Service)". Channel Islands National Park. U.S. National Park Service. Retrieved 9 May 2015. ^ "Terrestrial Invasive – Channel Islands National Park (U.S. National Park Service)". Channel Islands National Park. U.S. National Park Service. Retrieved 9 May 2015. ^ Sahagun, Louis (October 7, 2016). "The lowly earthworm poses a dire threat to this California island". Los Angeles Times. Retrieved 11 October 2016. ^ "Animals – Channel Islands National Park (U.S. National Park Service)". Channel Islands National Park. U.S. National Park Service. Retrieved 9 May 2015. ^ Louis Sahagun (2012-01-19). "Catalina Island fox makes astounding comeback". Los Angeles Times. Retrieved 2012-01-21. ^ "Peregrine falcon – Channel Islands National Park (U.S. National Park Service)". Channel Islands National Park. U.S. National Park Service. Retrieved 5 June 2015. ^ "Island Fox – Channel Islands National Park (U.S. National Park Service)". Channel Islands National Park. U.S. National Park Service. Retrieved 7 May 2015. ^ "Bald Eagle – Channel Islands National Park (U.S. National Park Service)". Channel Islands National Park. U.S. National Park Service. Retrieved 5 June 2015. Wikimedia Commons has media related to Channel Islands, California.